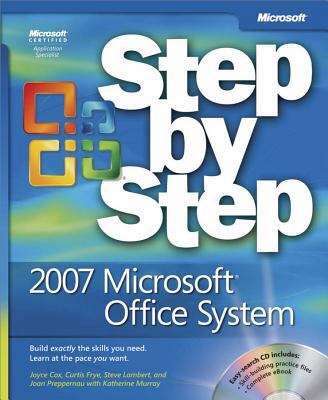 Quickly teach yourself how to use Microsoft Office Access 2007, Excel 2007, Outlook 2007, PowerPoint 2007, and Word 2007. With Step By Step, you set the pace--building and practicing the skills you need, just when you need them! Take control of your day--organize your e-mail, calendar, and meetings Learn the essentials for creating effective documents Build spreadsheets and perform calculations on your data Design database applications to help manage information Produce and deliver compelling slide show presentations Organize and format text to craft professional-quality documents Your all-in-one learning experience includes: Files for building skills and practicing the book's lessons Fully searchable eBook Bonus quick reference to the Ribbon, the new Microsoft Office interface Windows Vista Product Guide eBook--plus other resources on CD A Note Regarding the CD or DVD The print version of this book ships with a CD or DVD. For those customers purchasing one of the digital formats in which this book is available, we are pleased to offer the CD/DVD content as a free download via O'Reilly Media's Digital Distribution services. To download this content, please visit O'Reilly's web site, search for the title of this book to find its catalog page, and click on the link below the cover image (Examples, Companion Content, or Practice Files). Note that while we provide as much of the media content as we are able via free download, we are sometimes limited by licensing restrictions. Please direct any questions or concerns to booktech@oreilly.com.